I became a licensed diver on a whim. My cousin was taking the course and wanted some company so I joined him. I completed my Open Water certification with SSI (Scuba Schools International) in Michigan in 1993. Despite holding a dive license for over 10 years, I've still got less than 100 dives under my belt. Nevertheless, I've dove in some cool places, managing to take about one dive trip a year. Here are the primary places I've dove, in chronological order and some basic info. 1993 Stoney Lake, Michigan This where I got my open water license, in a chilly inland lake. Supposedly Michigan offers fantastic wreck diving (due to the fresh water Great Lakes) but I've yet to dive in a Great Lake. 1994 Guam I was still too inexperienced to really enjoy the sites without concentrating on my diving skills but it was a real treat to dive in 85 degree water without a wet suit. I sure felt naked at first. 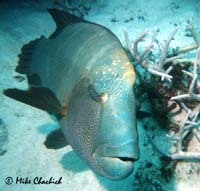 It was my first tropical dive location -- multi-coloured fish, what a novelty! We also dove a wreck site where a WW2 wreck (the Tokai Maru) is sitting on top of a WW1 wreck. Read my letter home about this trip for more details. 1995 Phuket, Thailand This was another great tropical dive experience. This was a memorable trip -- the first time I saw a shark and the first time I was attacked by sea life (not the shark, luckily)! I wrote a letter home about this trip too. 1996 Cebu, Philippines By this time, tropical sea life -- moray eel, lion fish, corals, etc. -- was starting to get old hat. I'm getting spoiled! Michigan diving was just a hazy memory. Ran out of air and had to use my partner's octopus for the safety stop -- but the damn thing had probably never been serviced and I was breathing 35% water along with the air! That was a bit disconcerting at first. The lack of pictures of the underwater portion of my trips gets me thinking about getting an underwater camera. Now I'm back to diving in temperatures necessitating a wetsuit but Izu has a rich variety of sea life, much more than you'd expect for this latitude. Moray eel, flounder, and soft corals aplenty. Started taking pictures with an Ikelite Aquashot II disposable camera housing. Lost the camera on my second dive! Retrieved it at the surface but made a note to find a way to clip it to myself. Got lots of crummy pictures but a few good ones too. Despite the exotic sound of the location, it was a pretty lame place to dive. The water was very warm and the corals were mostly bleached dead. We're talking 88F (31C) water. Near the hotel beach it was actually over 90F and we had to get into the hotel pool to cool off! Did get to see a puffer fish puff itself up and a big 2 foot long grouper. 1998 Cairns, Australia One of the holy grails of diving -- The Great Barrier reef. And, yes, it was pretty damned cool. Big man-sized clams, a big Napoleon fish hanging around like a puppy dog, sea turtles looking absolutely elegant and sleek reef sharks -- they were all there. Also did my first (one night) live-aboard and night dive. Truly a trip to remember. 1999 Izu, Japan More bright fish, lots of moray eel, and soft corals. 1999 Okinawa, Japan Really nice tropical diving. Didn't see any big ooh ahh type things but there was a large variety of sea life. Should have boned up on my fish identification skills. Did see my first octopus, however. Was annoyed that they wouldn't let me night dive despite the fact that I'd done it before. 1999 Izu, Japan Back to Izu -- it's the closest to Tokyo and lots and lots to see. During this period, I achieved my PADI Advanced Open Water certification here with the help of instructor and friend, Matt Endo of Mar Scuba. If you want to dive near Tokyo, he's the one to call.